Back in the ’80s and ’90s, before he reinvented himself as an action filmmaker (Hero, House Of Flying Daggers, The Flowers Of War), Zhang Yimou specialized in female-centric melodramas, usually with a strong political bent. Gong Li was his muse during this period—she starred in his first seven features—and the end of their personal and professional relationship, following 1995’s Shanghai Triad, likewise marked the end of that phase of Zhang’s career, during which every new film constituted a major world-cinema event. Zhang and Gong briefly reconciled for 2006’s historical epic Curse Of The Golden Flower, but Coming Home, their latest collaboration, marks the first time in two decades that they’ve attempted to revisit their mutual heyday. It’s a less pointed and implicitly feminist work than such classics as Raise The Red Lantern and The Story Of Qiu Ju—one could even call it a shameless weepie. Still, it’s a welcome throwback to one of the most emotionally wrenching actor-director partnerships in film history. 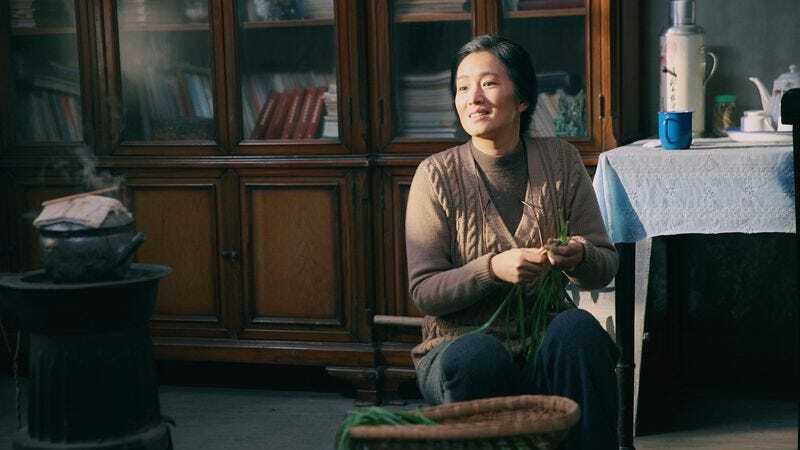 Set during and immediately after the Cultural Revolution, Coming Home (no relation to the 1978 film starring Jon Voight and Jane Fonda) does require some heavy-duty suspension of disbelief, as it involves a serious case of movie amnesia. When college professor Yanshi (Chen Daoming) is arrested for allegedly subversive activities and thrown in a re-education camp, his wife, Wanyu (Gong), is forced to raise their daughter, Dan Dan (Zhang Huiwen), alone. An aspiring ballerina whose head has been filled with state propaganda, Dan Dan promptly turns her father in to the authorities when he escapes at one point. But that’s nothing compared to the torture Yanshi experiences when he’s finally released, years later, only to find that Wanyu no longer remembers him. More specifically, she knows that she has a husband who’s in prison, but she doesn’t recognize Yanshi as that man. Instead, she alternately mistakes him for a stranger or—even worse—for the party official she once slept with in order to keep Yanshi from being executed. There are some pretty weird delusional syndromes out there (for example, the Capgras delusion, in which a loved one is believed to have been replaced by an identical-looking impostor), but not one quite this specific. Viewed as post-traumatic metaphor, however, it makes for an effectively cornball tearjerker, with Yanshi posing as various menial workers (piano tuner, etc.) and attempting to jog Wanyu’s memory somehow. Part returning-POW saga and part amnesiac romance, Coming Home is primarily an actors’ showcase; Zhang eschews his customary experiments with color and kineticism in favor of a solemn, gray moodiness (it’s the kind of film that you erroneously remember in black and white), punctuated by Chen and Gong’s intense bursts of feeling. Less effective is the newcomer playing Dan Dan, whose performance sometimes verges on shrill, even in the context of a teenage girl brainwashed by a repressive regime. And Chen Qigang’s syrupy score is just overkill. But it’s good to see Zhang put the pageantry aside for a moment and provide a reminder—even if it’s a relatively sappy one—of what he and Gong can do.